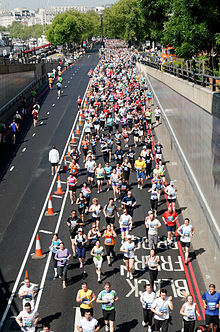 The 10K run is a long-distance road running competition over a distance of ten kilometres (6.2 miles). Also referred to as the 10K road race, 10 km, or simply 10K, it is one of the most common types of road running event, alongside the shorter 5K and longer half marathon and marathon. It is usually distinguished from the 10,000 metres track running event by stating the distance in kilometres, rather than metres. The 800 metres, or 800 meters (US spelling), is a common track running event. It is the shortest common middle-distance running event. The 800 metres is run over two laps of the track (400 metre track) and has been an Olympic event since the first games in 1896. During indoor track season the event is usually run on a 200-metre track, therefore requiring four laps. 50 metres is a sprint event in track and field. It is a relatively uncommon non-championship event for indoor track and field, normally dominated by the best outdoor 100 metres runners. At outdoor athletics competitions it is used in the Special Olympics and a rare distance, at least for senior athletes. It is an alternative to the 60 metres running event. The imperial distance for 50 metres is 54.68 yards. The European Mountain Running Championships is an annual international mountain running race. Inaugurated in 2002, it is organised by the European Athletic Association (EAA) in July each year. The venue for the championships is changed each year. The European Athletics Indoor Championships is a biennial indoor track and field competition for European athletes that is organised by the European Athletic Association. It was held for the first time in 1970, replacing the European Indoor Games, its predecessor event first held in 1966. The NACAC Cross Country Championships is an annual regional cross country running competition for athletes representing member nations of the North America, Central America and Caribbean Athletic Association (NACAC). The event was inaugurated in 2005 and was held in Florida, United States until 2009. The following two editions were held in Trinidad and Tobago. The IAAF Hall of Fame was established by the International Association of Athletics Federations in 2012. It is intended to honor individuals who have made valuable contributions in the sport of athletics both internationally and in their home countries that match certain criteria. Do you have a question about Sport of athletics that you can't find the answer to? Athletics records in the Summer Olympic Games have been recorded since 1896. The modern Summer Olympic Games have been held every four years since the first Games in 1896 (except 1916 due to the First World War, and 1940 and 1944 due to the Second World War) and Olympic records are recognised by the International Olympic Committee (IOC) in each event. The athletics events, which take place at each Games, are divided into four groups: track events (including sprints, middle- and long-distance running, hurdling and relays), field events (including javelin, discus, hammer, pole vault, long and triple jumps), road events (such as walks and the marathon) and combined events (the heptathlon and the decathlon). Women compete in 23 athletics events during the Games, and men compete in 24; while 21 of the events are the same for both men and women, men exclusively compete in the 50 km walk, the women's combined event is the heptathlon while the men compete in the decathlon, and the short distance hurdles for women is contested over 100 m, ten metres shorter than the men's event. by athletes who are representing one of the ODECABE's member federations. Both the initial records and the records broken in 2010 can be found on the official Games webpage. South American Games records in athletics are set by athletes competing from a range of member nations of the Organización Deportiva Suramericana commonly known as ODESUR.